Currency: Dinar = 1000 fils. KM#17 10 Fils. Year: 2000 - AH1420. Weight: 3.35g. Metal: Brass. Diameter: 21.00 mm. Edge: Plain. Alignment: Medal. Mint: N/A. Obverse: "دولة البحرين" (State of Bahrain) in Arabic at the top. Palm tree in center circle. Date on both sides outside the circle. "STATE OF BAHRAIN" outside the circle at the bottom. Reverse: Numeric "10" denomination back of boxed "فلس" (fils) within circle, chain border. Mintage: N/A. Minted Years: 1992 and 2000. Ruler: Hamad ibn Isa Al-Khalifah. KM#18 25 Fils. Year: 2000 - AH1420. Weight: 3.50g. Metal: Copper-Nickel. Diameter: 19.50 mm. Edge: Reeded. Alignment: Medal. Mint: N/A. Obverse: "دولة البحرين" (State of Bahrain) in Arabic at the top. Ancient drawing in center circle. Date on both sides outside the circle. "STATE OF BAHRAIN" outside the circle at the bottom. Reverse: Numeric "25" denomination back of boxed "فلس" (fils) within circle, chain border. Mintage: N/A. Minted Years: 1992 and 2000. Ruler: Hamad ibn Isa Al-Khalifah. KM#19 50 Fils. Year: 2000 - AH1420. Weight: 4.50g. Metal: Copper-Nickel. Diameter: 21.50 mm. Edge: Reeded. Alignment: Medal. Mint: N/A. Obverse: "دولة البحرين" (State of Bahrain) in Arabic at the top. Abstract Sailboat in center circle. Date on both sides outside the circle. "STATE OF BAHRAIN" outside the circle at the bottom. Reverse: Numeric "50" denomination back of boxed "فلس" (fils) within circle, chain border. Mintage: N/A. Minted Years: 1992 and 2000. Ruler: Hamad ibn Isa Al-Khalifah. KM#20 100 Fils. Year: 2000 - AH1420. Weight: 6.00g. Metal: Bi-Metallic; Copper-Nickel in center and Brass ring. Diameter: 24.00 mm. Edge: Reeded. Alignment: Medal. Mint: N/A. Obverse: "دولة البحرين" (State of Bahrain) in Arabic at the top. Bahrain's Coats and Arms. Date on both sides outside the circle. "STATE OF BAHRAIN" outside the circle at the bottom. Reverse: Numeric "100" denomination back of boxed "فلس" (fils) within circle, chain border. Mintage: N/A. Minted Years: 1992, 1995, 1997 and 2000. Ruler: Hamad ibn Isa Al-Khalifah. KM#20 500 Fils. Year: 2000. Weight: 9.00g. Metal: Bi-Metallic; Brass in center and Copper-Nickel ring. Diameter: 26.50 mm. Edge: Reeded. Alignment: Medal. Mint: N/A. 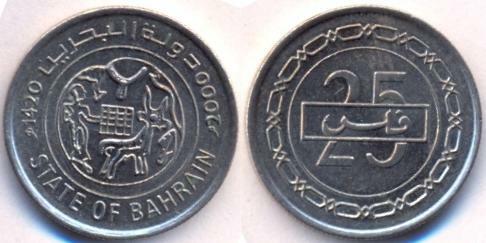 Obverse: "STATE OF BAHRAIN" on the left side. "دولة البحرين" on the right side. GCC Pearl Monument in center. Date at the bottom; all within Brass circle. Reverse: "فلس" (fils) at the top. Numeric "500" denomination in the center and "FILS" written at the bottom; all within Brass circle. Mintage: N/A. Minted Years: 2000 and 2001. Ruler: Hamad ibn Isa Al-Khalifah. KM#20 100 Fils. Year: 2001 - AH1422. Weight: 6.00g. Metal: Bi-Metallic; Copper-Nickel in center and Brass ring. Diameter: 24.00 mm. Edge: Reeded. Alignment: Medal. Mint: N/A. 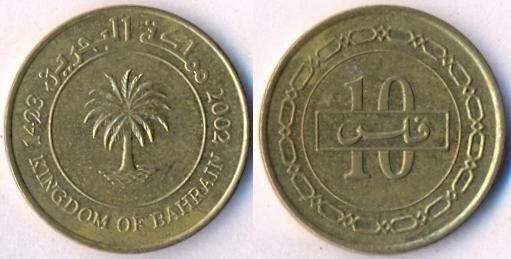 Obverse: "دولة البحرين" (State of Bahrain) in Arabic at the top. Bahrain's Coats and Arms. Date on both sides outside the circle. "STATE OF BAHRAIN" outside the circle at the bottom. Reverse: Numeric "100" denomination back of boxed "فلس" (fils) within circle, chain border. Mintage: N/A. Minted Years: 1992, 1995, 1997 and 2000. Ruler: Hamad ibn Isa Al-Khalifah. KM#20 500 Fils. Year: 2001. Weight: 9.00g. Metal: Bi-Metallic; Brass in center and Copper-Nickel ring. Diameter: 26.50 mm. Edge: Reeded. Alignment: Medal. Mint: N/A. Obverse: "STATE OF BAHRAIN" on the left side. "دولة البحرين" on the right side. GCC Pearl Monument in center. Date at the bottom; all within Brass circle. Reverse: "فلس" (fils) at the top. Numeric "500" denomination in the center and "FILS" written at the bottom; all within Brass circle. Mintage: N/A. Minted Years: 2000 and 2001. Ruler: Hamad ibn Isa Al-Khalifah. KM#28 10 Fils. Year: 2002 - AH1423. Weight: 3.35g. Metal: Brass. Diameter: 21.00 mm. Edge: Plain. Alignment: Medal. Mint: N/A. Obverse: "مملكة البحرين" (Kingdom of Bahrain) in Arabic at the top. Palm tree in center circle. Date on both sides outside the circle. "KINGDOM OF BAHRAIN" outside the circle at the bottom. Reverse: Numeric "10" denomination back of boxed "فلس" (fils) within circle, chain border. Mintage: N/A. Minted Years: 2002, 2004, 2005, 2007 and 2008. Ruler: Hamad ibn Isa Al-Khalifah. KM#24 25 Fils. Year: 2002 - AH1423. Weight: 3.50g. Metal: Copper-Nickel. Diameter: 19.50 mm. Edge: Reeded. Alignment: Medal. Mint: N/A. Obverse: "مملكة البحرين" (Kingdom of Bahrain) in Arabic at the top. Ancient drawing in center circle. Date on both sides outside the circle. "KINGDOM OF BAHRAIN" outside the circle at the bottom. Reverse: Numeric "25" denomination back of boxed "فلس" (fils) within circle, chain border. Mintage: N/A. Minted Years: 2002, 2005 and 2007. Ruler: Hamad ibn Isa Al-Khalifah. KM#25 50 Fils. Year: 2002 - AH1423. Weight: 4.50g. Metal: Copper-Nickel. Diameter: 21.50 mm. Edge: Reeded. Alignment: Medal. Mint: N/A. Obverse: "مملكة البحرين" (Kingdom of Bahrain) in Arabic at the top. Abstract Sailboat in center circle. Date on both sides outside the circle. "KINGDOM OF BAHRAIN" outside the circle at the bottom. Reverse: Numeric "50" denomination back of boxed "فلس" (fils) within circle, chain border. Mintage: N/A. Minted Years: 2002, 2005, 2007 and 2008. Ruler: Hamad ibn Isa Al-Khalifah. KM#26 100 Fils. Year: 2002 - AH1423. Weight: 6.00g. Metal: Bi-Metallic; Copper-Nickel in center and Brass ring. Diameter: 24.00 mm. Edge: Reeded. Alignment: Medal. Mint: N/A. Obverse: "مملكة البحرين" (Kingdom of Bahrain) in Arabic at the top. Bahrain's Coats and Arms. Date on both sides outside the circle. "KINGDOM OF BAHRAIN" outside the circle at the bottom. Reverse: Numeric "100" denomination back of boxed "فلس" (fils) within circle, chain border. Mintage: N/A. Minted Years: 2002 and 2005-2008. Ruler: Hamad ibn Isa Al-Khalifah. KM#27 500 Fils. Year: 2002. Weight: 9.00g. Metal: Bi-Metallic; Brass in center and Copper-Nickel ring. Diameter: 26.50 mm. Edge: Reeded. Alignment: Medal. Mint: N/A. Obverse: "KINGDOM OF BAHRAIN" on the left side. "مملكة البحرين" on the right side. GCC Pearl Monument in center. Date at the bottom; all within Brass circle. Reverse: "فلس" (fils) at the top. Numeric "500" denomination in the center and "FILS" written at the bottom; all within Brass circle. Mintage: N/A. Minted Years: One year type. Ruler: Hamad ibn Isa Al-Khalifah. KM#28 10 Fils. Year: 2004 - AH1424. Weight: 3.35g. Metal: Brass. Diameter: 21.00 mm. Edge: Plain. Alignment: Medal. Mint: N/A. Obverse: "مملكة البحرين" (Kingdom of Bahrain) in Arabic at the top. Palm tree in center circle. Date on both sides outside the circle. "KINGDOM OF BAHRAIN" outside the circle at the bottom. Reverse: Numeric "10" denomination back of boxed "فلس" (fils) within circle, chain border. Mintage: N/A. Minted Years: 2002, 2004, 2005, 2007 and 2008. Ruler: Hamad ibn Isa Al-Khalifah. KM#29 100 Fils. Year: 2004 - AH1425. Weight: 6.00g. Metal: Bi-Metallic; Copper-Nickel in center and Brass ring. Diameter: 24.00 mm. Edge: Reeded. Alignment: Medal. Mint: N/A. 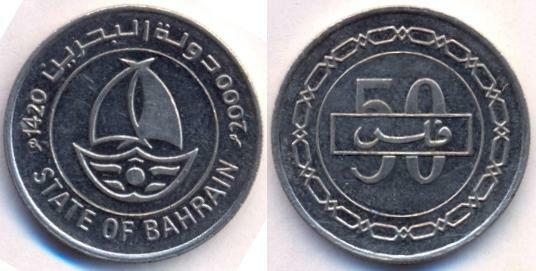 Obverse: "KINGDOM OF BAHRAIN" (above). "1st BAHRAIN GRAND PRIX" (below). Dates on both sides outside the circle. Reverse: Numeric "100" denomination back of boxed "فلس" (fils) within circle, chain border. Mintage: N/A. Minted Years: One year type. Ruler: Hamad ibn Isa Al-Khalifah. Note: This Grand Prix was held on 04th April 2004. KM#30 5 Fils. Year: 2005 - AH1426. Weight: 2.50g. Metal: Brass. Diameter: 19.00 mm. Edge: Plain. Alignment: Medal. Mint: N/A. Obverse: "مملكة البحرين" (Kingdom of Bahrain) in Arabic at the top. Palm tree in center circle. Date on both sides outside the circle. "KINGDOM OF BAHRAIN" outside the circle at the bottom. Reverse: Numeric "5" denomination back of boxed "فلس" (fils) within circle, chain border. Mintage: N/A. Minted Years: 2005 and 2007. Ruler: Hamad ibn Isa Al-Khalifah. KM#28 10 Fils. Year: 2005 - AH1426. Weight: 3.35g. Metal: Brass. Diameter: 21.00 mm. Edge: Plain. Alignment: Medal. Mint: N/A. Obverse: "مملكة البحرين" (Kingdom of Bahrain) in Arabic at the top. Palm tree in center circle. Date on both sides outside the circle. "KINGDOM OF BAHRAIN" outside the circle at the bottom. Reverse: Numeric "10" denomination back of boxed "فلس" (fils) within circle, chain border. Mintage: N/A. Minted Years: 2002, 2004, 2005, 2007 and 2008. Ruler: Hamad ibn Isa Al-Khalifah. KM#24 25 Fils. Year: 2005 - AH1426. Weight: 3.50g. Metal: Copper-Nickel. Diameter: 19.50 mm. Edge: Reeded. Alignment: Medal. Mint: N/A. Obverse: "مملكة البحرين" (Kingdom of Bahrain) in Arabic at the top. Ancient drawing in center circle. Date on both sides outside the circle. "KINGDOM OF BAHRAIN" outside the circle at the bottom. Reverse: Numeric "25" denomination back of boxed "فلس" (fils) within circle, chain border. Mintage: N/A. Minted Years: 2002, 2005 and 2007. Ruler: Hamad ibn Isa Al-Khalifah. KM#25 50 Fils. Year: 2005 - AH1426. Weight: 4.50g. Metal: Copper-Nickel. Diameter: 21.50 mm. Edge: Reeded. Alignment: Medal. Mint: N/A. Obverse: "مملكة البحرين" (Kingdom of Bahrain) in Arabic at the top. Abstract Sailboat in center circle. Date on both sides outside the circle. "KINGDOM OF BAHRAIN" outside the circle at the bottom. Reverse: Numeric "50" denomination back of boxed "فلس" (fils) within circle, chain border. Mintage: N/A. Minted Years: 2002, 2005, 2007 and 2008. Ruler: Hamad ibn Isa Al-Khalifah. KM#26 100 Fils. Year: 2005 - AH1426. Weight: 6.00g. Metal: Bi-Metallic; Copper-Nickel in center and Brass ring. Diameter: 24.00 mm. Edge: Reeded. Alignment: Medal. Mint: N/A. Obverse: "مملكة البحرين" (Kingdom of Bahrain) in Arabic at the top. Bahrain's Coats and Arms. Date on both sides outside the circle. "KINGDOM OF BAHRAIN" outside the circle at the bottom. Reverse: Numeric "100" denomination back of boxed "فلس" (fils) within circle, chain border. Mintage: N/A. Minted Years: 2002 and 2005-2008. Ruler: Hamad ibn Isa Al-Khalifah. KM#26 100 Fils. Year: 2006 - AH1427. Weight: 6.00g. Metal: Bi-Metallic; Copper-Nickel in center and Brass ring. Diameter: 24.00 mm. Edge: Reeded. Alignment: Medal. Mint: N/A. Obverse: "مملكة البحرين" (Kingdom of Bahrain) in Arabic at the top. Bahrain's Coats and Arms. Date on both sides outside the circle. "KINGDOM OF BAHRAIN" outside the circle at the bottom. Reverse: Numeric "100" denomination back of boxed "فلس" (fils) within circle, chain border. Mintage: N/A. Minted Years: 2002 and 2005-2008. Ruler: Hamad ibn Isa Al-Khalifah. KM#30 5 Fils. Year: 2007 - AH1428. Weight: 2.50g. Metal: Brass. Diameter: 19.00 mm. Edge: Plain. Alignment: Medal. Mint: N/A. Obverse: "مملكة البحرين" (Kingdom of Bahrain) in Arabic at the top. Palm tree in center circle. Date on both sides outside the circle. "KINGDOM OF BAHRAIN" outside the circle at the bottom. Reverse: Numeric "5" denomination back of boxed "فلس" (fils) within circle, chain border. Mintage: N/A. Minted Years: 2005 and 2007. Ruler: Hamad ibn Isa Al-Khalifah. KM#28 10 Fils. Year: 2007 - AH1428. Weight: 3.35g. Metal: Brass. Diameter: 21.00 mm. Edge: Plain. Alignment: Medal. Mint: N/A. Obverse: "مملكة البحرين" (Kingdom of Bahrain) in Arabic at the top. Palm tree in center circle. Date on both sides outside the circle. "KINGDOM OF BAHRAIN" outside the circle at the bottom. Reverse: Numeric "10" denomination back of boxed "فلس" (fils) within circle, chain border. Mintage: N/A. Minted Years: 2002, 2004, 2005, 2007 and 2008. Ruler: Hamad ibn Isa Al-Khalifah. KM#24 25 Fils. Year: 2007 - AH1428. Weight: 3.50g. Metal: Copper-Nickel. Diameter: 19.50 mm. Edge: Reeded. Alignment: Medal. Mint: N/A. Obverse: "مملكة البحرين" (Kingdom of Bahrain) in Arabic at the top. Ancient drawing in center circle. Date on both sides outside the circle. "KINGDOM OF BAHRAIN" outside the circle at the bottom. Reverse: Numeric "25" denomination back of boxed "فلس" (fils) within circle, chain border. Mintage: N/A. Minted Years: 2002, 2005 and 2007. Ruler: Hamad ibn Isa Al-Khalifah. KM#25 50 Fils. Year: 2007 - AH1428. Weight: 4.50g. Metal: Copper-Nickel. Diameter: 21.50 mm. Edge: Reeded. Alignment: Medal. Mint: N/A. Obverse: "مملكة البحرين" (Kingdom of Bahrain) in Arabic at the top. Abstract Sailboat in center circle. Date on both sides outside the circle. "KINGDOM OF BAHRAIN" outside the circle at the bottom. Reverse: Numeric "50" denomination back of boxed "فلس" (fils) within circle, chain border. Mintage: N/A. Minted Years: 2002, 2005, 2007 and 2008. Ruler: Hamad ibn Isa Al-Khalifah. KM#26 100 Fils. Year: 2007 - AH1428. Weight: 6.00g. Metal: Bi-Metallic; Copper-Nickel in center and Brass ring. Diameter: 24.00 mm. Edge: Reeded. Alignment: Medal. Mint: N/A. Obverse: "مملكة البحرين" (Kingdom of Bahrain) in Arabic at the top. Bahrain's Coats and Arms. Date on both sides outside the circle. "KINGDOM OF BAHRAIN" outside the circle at the bottom. Reverse: Numeric "100" denomination back of boxed "فلس" (fils) within circle, chain border. Mintage: N/A. Minted Years: 2002 and 2005-2008. Ruler: Hamad ibn Isa Al-Khalifah. KM#28 10 Fils. Year: 2008 - AH1429. Weight: 3.35g. Metal: Brass. Diameter: 21.00 mm. Edge: Plain. Alignment: Medal. Mint: N/A. Obverse: "مملكة البحرين" (Kingdom of Bahrain) in Arabic at the top. Palm tree in center circle. Date on both sides outside the circle. "KINGDOM OF BAHRAIN" outside the circle at the bottom. Reverse: Numeric "10" denomination back of boxed "فلس" (fils) within circle, chain border. Mintage: N/A. Minted Years: 2002, 2004, 2005, 2007 and 2008. Ruler: Hamad ibn Isa Al-Khalifah. KM#25 50 Fils. Year: 2008 - AH1429. Weight: 4.50g. Metal: Copper-Nickel. Diameter: 21.50 mm. Edge: Reeded. Alignment: Medal. Mint: N/A. Obverse: "مملكة البحرين" (Kingdom of Bahrain) in Arabic at the top. Abstract Sailboat in center circle. Date on both sides outside the circle. "KINGDOM OF BAHRAIN" outside the circle at the bottom. Reverse: Numeric "50" denomination back of boxed "فلس" (fils) within circle, chain border. Mintage: N/A. Minted Years: 2002, 2005, 2007 and 2008. Ruler: Hamad ibn Isa Al-Khalifah. KM#26 100 Fils. Year: 2008 - AH1429. Weight: 6.00g. Metal: Bi-Metallic; Copper-Nickel in center and Brass ring. Diameter: 24.00 mm. Edge: Reeded. Alignment: Medal. Mint: N/A. Obverse: "مملكة البحرين" (Kingdom of Bahrain) in Arabic at the top. Bahrain's Coats and Arms. Date on both sides outside the circle. "KINGDOM OF BAHRAIN" outside the circle at the bottom. Reverse: Numeric "100" denomination back of boxed "فلس" (fils) within circle, chain border. Mintage: N/A. Minted Years: 2002 and 2005-2008. Ruler: Hamad ibn Isa Al-Khalifah. Note: The word "Fils" is stylishly written from this year onwards. The word "فلس" is replaced with "فلوس" on 5 and 10 fils coins. 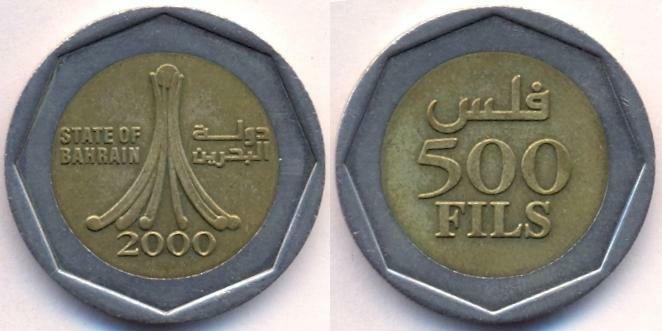 "فلس" is also replaced with word "فلسا" on 25 and 50 fils coins. 5 Fils. Year: 2009 - AH1430. Weight: 2.49g. Metal: Brass. Diameter: 19.00 mm. Edge: Plain. Alignment: Medal. Mint: N/A. Obverse: "مملكة البحرين" (Kingdom of Bahrain) in Arabic at the top. Palm tree in center circle. Date on both sides outside the circle. "KINGDOM OF BAHRAIN" outside the circle at the bottom. Reverse: Numeric "5" denomination back of boxed "فلوس" (fils) within circle, chain border. Mintage: N/A. Minted Years: One year type. Ruler: Hamad ibn Isa Al-Khalifah. 10 Fils. Year: 2009 - AH1430. Weight: 3.33g. Metal: Brass. Diameter: 21.00 mm. Edge: Plain. Alignment: Medal. Mint: N/A. Obverse: "مملكة البحرين" (Kingdom of Bahrain) in Arabic at the top. Palm tree in center circle. Date on both sides outside the circle. "KINGDOM OF BAHRAIN" outside the circle at the bottom. Reverse: Numeric "10" denomination back of boxed "فلوس" (fils) within circle, chain border. Mintage: N/A. Minted Years: One year type. Ruler: Hamad ibn Isa Al-Khalifah. 25 Fils. Year: 2009 - AH1430. Weight: 3.50g. Metal: Copper-Nickel. Diameter: 19.50 mm. Edge: Reeded. Alignment: Medal. Mint: N/A. Obverse: "مملكة البحرين" (Kingdom of Bahrain) in Arabic at the top. Ancient drawing in center circle. Date on both sides outside the circle. "KINGDOM OF BAHRAIN" outside the circle at the bottom. Reverse: Numeric "25" denomination back of boxed "فلسا" (fils) within circle, chain border. Mintage: N/A. Minted Years: 2009-2011 and 2013-2016. Ruler: Hamad ibn Isa Al-Khalifah. 50 Fils. Year: 2009 - AH1430. Weight: 4.50g. Metal: Copper-Nickel. Diameter: 21.50 mm. Edge: Reeded. Alignment: Medal. Mint: N/A. Obverse: "مملكة البحرين" (Kingdom of Bahrain) in Arabic at the top. Abstract Sailboat in center circle. Date on both sides outside the circle. "KINGDOM OF BAHRAIN" outside the circle at the bottom. Reverse: Numeric "50" denomination back of boxed "فلسا" (fils) within circle, chain border. Mintage: N/A. Minted Years: 2009-2011, 2014-2016 and 2018. Ruler: Hamad ibn Isa Al-Khalifah. 100 Fils. Year: 2009 - AH1430. Weight: 6.00g. Metal: Bi-Metallic; Copper-Nickel in center and Brass ring. Diameter: 24.00 mm. Edge: Reeded. Alignment: Medal. Mint: N/A. Obverse: "مملكة البحرين" (Kingdom of Bahrain) in Arabic at the top. Bahrain's Coats and Arms. Date on both sides outside the circle. "KINGDOM OF BAHRAIN" outside the circle at the bottom. Reverse: Numeric "100" denomination back of boxed "فلس" (fils) within circle, chain border. Mintage: N/A. Minted Years: 2009-2011, 2014-2016 and 2018. Ruler: Hamad ibn Isa Al-Khalifah. 5 Fils. Year: 2010 - AH1431. Weight: 2.47g. Metal: Brass plated steel. Diameter: 19.00 mm. Edge: Plain. Alignment: Medal. Mint: N/A. Obverse: "مملكة البحرين" (Kingdom of Bahrain) in Arabic at the top. Palm tree in center circle. Date on both sides outside the circle. "KINGDOM OF BAHRAIN" outside the circle at the bottom. Reverse: Numeric "5" denomination back of boxed "فلوس" (fils) within circle, chain border. Mintage: N/A. Minted Years: 2010-2018. Ruler: Hamad ibn Isa Al-Khalifah. 10 Fils. Year: 2010 - AH1431. Weight: 3.38g. Metal: Brass plated steel. Diameter: 21.00 mm. Edge: Plain. Alignment: Medal. Mint: N/A. Obverse: "مملكة البحرين" (Kingdom of Bahrain) in Arabic at the top. Palm tree in center circle. Date on both sides outside the circle. "KINGDOM OF BAHRAIN" outside the circle at the bottom. Reverse: Numeric "10" denomination back of boxed "فلوس" (fils) within circle, chain border. Mintage: N/A. Minted Years: 2010-2018. Ruler: Hamad ibn Isa Al-Khalifah. 25 Fils. Year: 2010 - AH1431. Weight: 3.50g. Metal: Copper-Nickel. Diameter: 19.50 mm. Edge: Reeded. Alignment: Medal. Mint: N/A. Obverse: "مملكة البحرين" (Kingdom of Bahrain) in Arabic at the top. Ancient drawing in center circle. Date on both sides outside the circle. "KINGDOM OF BAHRAIN" outside the circle at the bottom. Reverse: Numeric "25" denomination back of boxed "فلسا" (fils) within circle, chain border. Mintage: N/A. Minted Years: 2009-2011 and 2013-2016. Ruler: Hamad ibn Isa Al-Khalifah. 50 Fils. Year: 2010 - AH1431. Weight: 4.50g. Metal: Copper-Nickel. Diameter: 21.50 mm. Edge: Reeded. Alignment: Medal. Mint: N/A. Obverse: "مملكة البحرين" (Kingdom of Bahrain) in Arabic at the top. Abstract Sailboat in center circle. Date on both sides outside the circle. "KINGDOM OF BAHRAIN" outside the circle at the bottom. Reverse: Numeric "50" denomination back of boxed "فلسا" (fils) within circle, chain border. Mintage: N/A. Minted Years: 2009-2011, 2014-2016 and 2018. Ruler: Hamad ibn Isa Al-Khalifah. 100 Fils. Year: 2010 - AH1431. Weight: 6.00g. Metal: Bi-Metallic; Copper-Nickel in center and Brass ring. Diameter: 24.00 mm. Edge: Reeded. Alignment: Medal. Mint: N/A. Obverse: "مملكة البحرين" (Kingdom of Bahrain) in Arabic at the top. Bahrain's Coats and Arms. Date on both sides outside the circle. "KINGDOM OF BAHRAIN" outside the circle at the bottom. Reverse: Numeric "100" denomination back of boxed "فلس" (fils) within circle, chain border. Mintage: N/A. Minted Years: 2009-2011, 2014-2016 and 2018. Ruler: Hamad ibn Isa Al-Khalifah. This 0.925 silver set was issued by Central Bank of Bahrain in December 2010 with approval from Rasheed Mohammed Al Maraj, the Governor of Central Bank of Bahrain. Only 500 sets were made and the set in my collection is numbered 382. 5 Fils. Year: 2010 - AH1431. Weight: 2.50g. Metal: 0.925 Silver. Diameter: 19.00 mm. Edge: Plain. Alignment: Medal. Mint: British Royal Mint. Obverse: "مملكة البحرين" (Kingdom of Bahrain) in Arabic at the top. Palm tree in center circle. Date on both sides outside the circle. "KINGDOM OF BAHRAIN" outside the circle at the bottom. Reverse: Numeric "5" denomination back of boxed "فلوس" (fils) within circle, chain border. Mintage: 500. Minted Years: One year type. Ruler: Hamad ibn Isa Al-Khalifah. 10 Fils. Year: 2010 - AH1431. Weight: 3.35g. Metal: 0.925 Silver. Diameter: 21.00 mm. Edge: Plain. Alignment: Medal. Mint: British Royal Mint. Obverse: "مملكة البحرين" (Kingdom of Bahrain) in Arabic at the top. Palm tree in center circle. Date on both sides outside the circle. "KINGDOM OF BAHRAIN" outside the circle at the bottom. Reverse: Numeric "10" denomination back of boxed "فلوس" (fils) within circle, chain border. Mintage: 500. Minted Years: One year type. Ruler: Hamad ibn Isa Al-Khalifah. 25 Fils. Year: 2010 - AH1431. Weight: 3.50g. Metal: 0.925 Silver. Diameter: 20.00 mm. Edge: Reeded. Alignment: Medal. Mint: British Royal Mint. Obverse: "مملكة البحرين" (Kingdom of Bahrain) in Arabic at the top. Ancient drawing in center circle. Date on both sides outside the circle. "KINGDOM OF BAHRAIN" outside the circle at the bottom. Reverse: Numeric "25" denomination back of boxed "فلسا" (fils) within circle, chain border. Mintage: 500. Minted Years: One year type. Ruler: Hamad ibn Isa Al-Khalifah. 50 Fils. Year: 2010 - AH1431. Weight: 4.50g. Metal: 0.925 Silver. Diameter: 22.00 mm. Edge: Reeded. Alignment: Medal. Mint: British Royal Mint. Obverse: "مملكة البحرين" (Kingdom of Bahrain) in Arabic at the top. Abstract Sailboat in center circle. Date on both sides outside the circle. "KINGDOM OF BAHRAIN" outside the circle at the bottom. Reverse: Numeric "50" denomination back of boxed "فلسا" (fils) within circle, chain border. Mintage: 500. Minted Years: One year type. Ruler: Hamad ibn Isa Al-Khalifah. 100 Fils. Year: 2010 - AH1431. Weight: 6.00g. Metal: 0.925 Silver. Diameter: 24.00 mm. Edge: Reeded. Alignment: Medal. Mint: British Royal Mint. 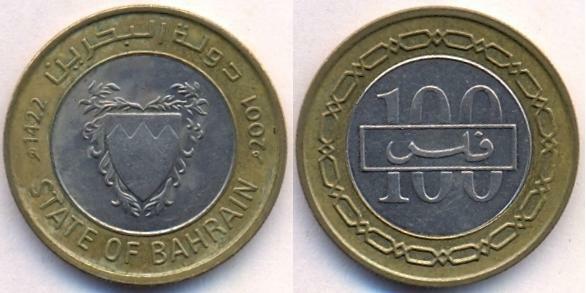 Obverse: "مملكة البحرين" (Kingdom of Bahrain) in Arabic at the top. Bahrain's Coats and Arms. Date on both sides outside the circle. "KINGDOM OF BAHRAIN" outside the circle at the bottom. Reverse: Numeric "100" denomination back of boxed "فلس" (fils) within circle, chain border. Mintage: 500. Minted Years: One year type. Ruler: Hamad ibn Isa Al-Khalifah. 500 Fils. Year: 2010. Weight: 9.00g. Metal: 0.925 Silver. Diameter: 27.00 mm. Edge: Reeded. Alignment: Medal. Mint: British Royal Mint. Obverse: "KINGDOM OF BAHRAIN" on the left side. "مملكة البحرين" on the right side. GCC Pearl Monument in center. Date at the bottom; all within Brass circle. Reverse: "فلس" (fils) at the top. Numeric "500" denomination in the center and "FILS" written at the bottom; all within Brass circle. Mintage: 500. Minted Years: One year type. Ruler: Hamad ibn Isa Al-Khalifah. 5 Fils. Year: 2011 - AH1432. Weight: 2.49g. Metal: Brass plated steel. Diameter: 19.00 mm. Edge: Plain. Alignment: Medal. Mint: N/A. Obverse: "مملكة البحرين" (Kingdom of Bahrain) in Arabic at the top. Palm tree in center circle. Date on both sides outside the circle. "KINGDOM OF BAHRAIN" outside the circle at the bottom. Reverse: Numeric "5" denomination back of boxed "فلوس" (fils) within circle, chain border. Mintage: N/A. Minted Years: 2010-2018. Ruler: Hamad ibn Isa Al-Khalifah. 10 Fils. Year: 2011 - AH1432. Weight: 3.35g. Metal: Brass plated steel. Diameter: 21.00 mm. Edge: Plain. Alignment: Medal. Mint: N/A. Obverse: "مملكة البحرين" (Kingdom of Bahrain) in Arabic at the top. Palm tree in center circle. Date on both sides outside the circle. "KINGDOM OF BAHRAIN" outside the circle at the bottom. Reverse: Numeric "10" denomination back of boxed "فلوس" (fils) within circle, chain border. Mintage: N/A. Minted Years: 2010-2018. Ruler: Hamad ibn Isa Al-Khalifah. 25 Fils. Year: 2011 - AH1432. Weight: 3.34g. Metal: Copper-Nickel. Diameter: 19.50 mm. Edge: Reeded. Alignment: Medal. Mint: N/A. Obverse: "مملكة البحرين" (Kingdom of Bahrain) in Arabic at the top. Ancient drawing in center circle. Date on both sides outside the circle. "KINGDOM OF BAHRAIN" outside the circle at the bottom. Reverse: Numeric "25" denomination back of boxed "فلسا" (fils) within circle, chain border. Mintage: N/A. Minted Years: 2009-2011 and 2013-2016. Ruler: Hamad ibn Isa Al-Khalifah. 50 Fils. Year: 2011 - AH1432. Weight: 4.50g. Metal: Copper-Nickel. Diameter: 21.50 mm. Edge: Reeded. Alignment: Medal. Mint: N/A. Obverse: "مملكة البحرين" (Kingdom of Bahrain) in Arabic at the top. Abstract Sailboat in center circle. Date on both sides outside the circle. "KINGDOM OF BAHRAIN" outside the circle at the bottom. Reverse: Numeric "50" denomination back of boxed "فلسا" (fils) within circle, chain border. Mintage: N/A. Minted Years: 2009-2011, 2014-2016 and 2018. Ruler: Hamad ibn Isa Al-Khalifah. 100 Fils. Year: 2011 - AH1432. Weight: 6.00g. Metal: Bi-Metallic; Copper-Nickel in center and Brass ring. Diameter: 24.00 mm. Edge: Reeded. Alignment: Medal. Mint: N/A. Obverse: "مملكة البحرين" (Kingdom of Bahrain) in Arabic at the top. Bahrain's Coats and Arms. Date on both sides outside the circle. "KINGDOM OF BAHRAIN" outside the circle at the bottom. Reverse: Numeric "100" denomination back of boxed "فلس" (fils) within circle, chain border. Mintage: N/A. Minted Years: 2009-2011, 2014-2016 and 2018. Ruler: Hamad ibn Isa Al-Khalifah. 5 Fils. Year: 2012 - AH1433. Weight: 2.49g. Metal: Brass plated steel. Diameter: 19.00 mm. Edge: Plain. Alignment: Medal. Mint: N/A. Obverse: "مملكة البحرين" (Kingdom of Bahrain) in Arabic at the top. Palm tree in center circle. Date on both sides outside the circle. "KINGDOM OF BAHRAIN" outside the circle at the bottom. Reverse: Numeric "5" denomination back of boxed "فلوس" (fils) within circle, chain border. Mintage: N/A. Minted Years: 2010-2018. Ruler: Hamad ibn Isa Al-Khalifah. 10 Fils. Year: 2012 - AH1433. Weight: 3.32g. Metal: Brass plated steel. Diameter: 21.00 mm. Edge: Plain. Alignment: Medal. Mint: N/A. Obverse: "مملكة البحرين" (Kingdom of Bahrain) in Arabic at the top. Palm tree in center circle. Date on both sides outside the circle. "KINGDOM OF BAHRAIN" outside the circle at the bottom. Reverse: Numeric "10" denomination back of boxed "فلوس" (fils) within circle, chain border. Mintage: N/A. Minted Years: 2010-2018. Ruler: Hamad ibn Isa Al-Khalifah. 5 Fils. Year: 2013 - AH1434. Weight: 2.49g. Metal: Brass plated steel. Diameter: 19.00 mm. Edge: Plain. Alignment: Medal. Mint: N/A. Obverse: "مملكة البحرين" (Kingdom of Bahrain) in Arabic at the top. Palm tree in center circle. Date on both sides outside the circle. "KINGDOM OF BAHRAIN" outside the circle at the bottom. Reverse: Numeric "5" denomination back of boxed "فلوس" (fils) within circle, chain border. Mintage: N/A. Minted Years: 2010-2018. Ruler: Hamad ibn Isa Al-Khalifah. 10 Fils. Year: 2013 - AH1434. Weight: 3.34g. Metal: Brass plated steel. Diameter: 21.00 mm. Edge: Plain. Alignment: Medal. Mint: N/A. Obverse: "مملكة البحرين" (Kingdom of Bahrain) in Arabic at the top. Palm tree in center circle. Date on both sides outside the circle. "KINGDOM OF BAHRAIN" outside the circle at the bottom. Reverse: Numeric "10" denomination back of boxed "فلوس" (fils) within circle, chain border. Mintage: N/A. Minted Years: 2010-2018. Ruler: Hamad ibn Isa Al-Khalifah. 25 Fils. Year: 2013 - AH1434. Weight: 3.50g. Metal: Copper-Nickel. Diameter: 19.50 mm. Edge: Reeded. Alignment: Medal. Mint: N/A. Obverse: "مملكة البحرين" (Kingdom of Bahrain) in Arabic at the top. Ancient drawing in center circle. Date on both sides outside the circle. "KINGDOM OF BAHRAIN" outside the circle at the bottom. Reverse: Numeric "25" denomination back of boxed "فلسا" (fils) within circle, chain border. Mintage: N/A. Minted Years: 2009-2011 and 2013-2016. Ruler: Hamad ibn Isa Al-Khalifah. 5 Fils. Year: 2014 - AH1435. Weight: 2.52g. Metal: Brass plated steel. Diameter: 19.00 mm. Edge: Plain. Alignment: Medal. Mint: N/A. Obverse: "مملكة البحرين" (Kingdom of Bahrain) in Arabic at the top. Palm tree in center circle. Date on both sides outside the circle. "KINGDOM OF BAHRAIN" outside the circle at the bottom. Reverse: Numeric "5" denomination back of boxed "فلوس" (fils) within circle, chain border. Mintage: N/A. Minted Years: 2010-2018. Ruler: Hamad ibn Isa Al-Khalifah. 10 Fils. Year: 2014 - AH1435. Weight: 3.36g. Metal: Brass plated steel. Diameter: 21.00 mm. Edge: Plain. Alignment: Medal. Mint: N/A. Obverse: "مملكة البحرين" (Kingdom of Bahrain) in Arabic at the top. Palm tree in center circle. Date on both sides outside the circle. "KINGDOM OF BAHRAIN" outside the circle at the bottom. Reverse: Numeric "10" denomination back of boxed "فلوس" (fils) within circle, chain border. Mintage: N/A. Minted Years: 2010-2018. Ruler: Hamad ibn Isa Al-Khalifah. 25 Fils. Year: 2014 - AH1435. Weight: 3.48g. Metal: Copper-Nickel. Diameter: 19.50 mm. Edge: Reeded. Alignment: Medal. Mint: N/A. Obverse: "مملكة البحرين" (Kingdom of Bahrain) in Arabic at the top. Ancient drawing in center circle. Date on both sides outside the circle. "KINGDOM OF BAHRAIN" outside the circle at the bottom. Reverse: Numeric "25" denomination back of boxed "فلسا" (fils) within circle, chain border. Mintage: N/A. Minted Years: 2009-2011 and 2013-2016. Ruler: Hamad ibn Isa Al-Khalifah. 50 Fils. Year: 2014 - AH1435. Weight: 4.54g. Metal: Copper-Nickel. Diameter: 21.50 mm. Edge: Reeded. Alignment: Medal. Mint: N/A. Obverse: "مملكة البحرين" (Kingdom of Bahrain) in Arabic at the top. Abstract Sailboat in center circle. Date on both sides outside the circle. "KINGDOM OF BAHRAIN" outside the circle at the bottom. Reverse: Numeric "50" denomination back of boxed "فلسا" (fils) within circle, chain border. Mintage: N/A. Minted Years: 2009-2011, 2014-2016 and 2018. Ruler: Hamad ibn Isa Al-Khalifah. 100 Fils. Year: 2014 - AH1435. Weight: 6.04g. Metal: Bi-Metallic; Copper-Nickel in center and Brass ring. Diameter: 24.00 mm. Edge: Reeded. Alignment: Medal. Mint: N/A. Obverse: "مملكة البحرين" (Kingdom of Bahrain) in Arabic at the top. Bahrain's Coats and Arms. Date on both sides outside the circle. "KINGDOM OF BAHRAIN" outside the circle at the bottom. Reverse: Numeric "100" denomination back of boxed "فلس" (fils) within circle, chain border. Mintage: N/A. Minted Years: 2009-2011, 2014-2016 and 2018. Ruler: Hamad ibn Isa Al-Khalifah. 100 Fils. Year: 2014. Weight: 6.00g. Metal: Bi-Metallic; Copper-Nickel in center and Brass ring. Diameter: 24.00 mm. Edge: Reeded. Alignment: Medal. Mint: N/A. Obverse: "KINGDOM OF BAHRAIN" written at the top. Bahrain's Grand Prix circuit tower and track in the circle. "2004 . 2014 BAHRAIN GRAND PRIX" written at the bottom section. Reverse: Numeric "100" denomination back of boxed "فلس" (fils) within circle, chain border. Mintage: N/A. Minted Years: One year type. Ruler: Hamad ibn Isa Al-Khalifah. Subject: 10 years of Bahrain Grand Prix. 5 Fils. Year: 2015 - AH1436. Weight: 2.52g. Metal: Brass plated steel. Diameter: 19.00 mm. Edge: Plain. Alignment: Medal. Mint: N/A. Obverse: "مملكة البحرين" (Kingdom of Bahrain) in Arabic at the top. Palm tree in center circle. Date on both sides outside the circle. "KINGDOM OF BAHRAIN" outside the circle at the bottom. Reverse: Numeric "5" denomination back of boxed "فلوس" (fils) within circle, chain border. Mintage: N/A. Minted Years: 2010-2018. Ruler: Hamad ibn Isa Al-Khalifah. 10 Fils. Year: 2015 - AH1436. Weight: 3.39g. Metal: Brass plated steel. Diameter: 21.00 mm. Edge: Plain. Alignment: Medal. Mint: N/A. Obverse: "مملكة البحرين" (Kingdom of Bahrain) in Arabic at the top. Palm tree in center circle. Date on both sides outside the circle. "KINGDOM OF BAHRAIN" outside the circle at the bottom. Reverse: Numeric "10" denomination back of boxed "فلوس" (fils) within circle, chain border. Mintage: N/A. Minted Years: 2010-2018. Ruler: Hamad ibn Isa Al-Khalifah. 25 Fils. Year: 2015 - AH1436. Weight: 3.50g. Metal: Copper-Nickel. Diameter: 19.50 mm. Edge: Reeded. Alignment: Medal. Mint: N/A. Obverse: "مملكة البحرين" (Kingdom of Bahrain) in Arabic at the top. Ancient drawing in center circle. Date on both sides outside the circle. "KINGDOM OF BAHRAIN" outside the circle at the bottom. Reverse: Numeric "25" denomination back of boxed "فلسا" (fils) within circle, chain border. Mintage: N/A. Minted Years: 2009-2011 and 2013-2016. Ruler: Hamad ibn Isa Al-Khalifah. 50 Fils. Year: 2015 - AH1436. Weight: 4.37g. Metal: Copper-Nickel. Diameter: 21.50 mm. Edge: Reeded. Alignment: Medal. Mint: N/A. 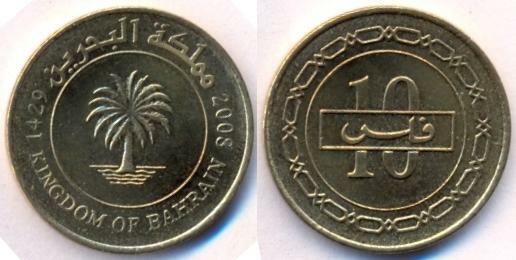 Obverse: "مملكة البحرين" (Kingdom of Bahrain) in Arabic at the top. Abstract Sailboat in center circle. Date on both sides outside the circle. "KINGDOM OF BAHRAIN" outside the circle at the bottom. Reverse: Numeric "50" denomination back of boxed "فلسا" (fils) within circle, chain border. Mintage: N/A. Minted Years: 22009-2011, 2014-2016 and 2018. Ruler: Hamad ibn Isa Al-Khalifah. 100 Fils. Year: 2015 - AH1436. Weight: 5.91g. Metal: Bi-Metallic; Copper-Nickel in center and Brass ring. Diameter: 24.00 mm. Edge: Reeded. Alignment: Medal. Mint: N/A. Obverse: "مملكة البحرين" (Kingdom of Bahrain) in Arabic at the top. Bahrain's Coats and Arms. Date on both sides outside the circle. "KINGDOM OF BAHRAIN" outside the circle at the bottom. Reverse: Numeric "100" denomination back of boxed "فلس" (fils) within circle, chain border. Mintage: N/A. Minted Years: 2009-2011, 2014-2016 and 2018. Ruler: Hamad ibn Isa Al-Khalifah. 5 Fils. Year: 2016 - AH1437. Weight: 2.49g. Metal: Brass plated steel. Diameter: 19.00 mm. Edge: Plain. Alignment: Medal. Mint: N/A. Obverse: "مملكة البحرين" (Kingdom of Bahrain) in Arabic at the top. Palm tree in center circle. Date on both sides outside the circle. "KINGDOM OF BAHRAIN" outside the circle at the bottom. Reverse: Numeric "5" denomination back of boxed "فلوس" (fils) within circle, chain border. Mintage: N/A. Minted Years: 2010-2018. Ruler: Hamad ibn Isa Al-Khalifah. 10 Fils. Year: 2016 - AH1437. Weight: 3.40g. Metal: Brass plated steel. Diameter: 21.00 mm. Edge: Plain. Alignment: Medal. Mint: N/A. Obverse: "مملكة البحرين" (Kingdom of Bahrain) in Arabic at the top. Palm tree in center circle. Date on both sides outside the circle. "KINGDOM OF BAHRAIN" outside the circle at the bottom. Reverse: Numeric "10" denomination back of boxed "فلوس" (fils) within circle, chain border. Mintage: N/A. Minted Years: 2010-2018. Ruler: Hamad ibn Isa Al-Khalifah. 25 Fils. Year: 2016 - AH1437. Weight: 3.49g. Metal: Copper-Nickel. Diameter: 19.50 mm. Edge: Reeded. Alignment: Medal. Mint: N/A. 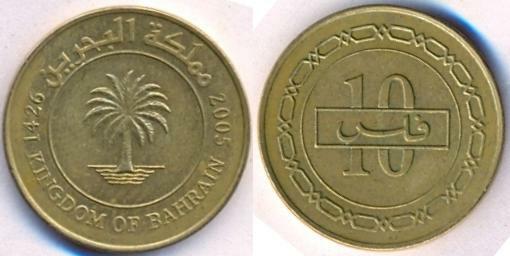 Obverse: "مملكة البحرين" (Kingdom of Bahrain) in Arabic at the top. Ancient drawing in center circle. Date on both sides outside the circle. "KINGDOM OF BAHRAIN" outside the circle at the bottom. Reverse: Numeric "25" denomination back of boxed "فلسا" (fils) within circle, chain border. Mintage: N/A. Minted Years: 2009-2011 and 2013-2016. Ruler: Hamad ibn Isa Al-Khalifah. 50 Fils. Year: 2016 - AH1437. Weight: 4.51g. Metal: Copper-Nickel. Diameter: 21.50 mm. Edge: Reeded. Alignment: Medal. Mint: N/A. Obverse: "مملكة البحرين" (Kingdom of Bahrain) in Arabic at the top. Abstract Sailboat in center circle. Date on both sides outside the circle. "KINGDOM OF BAHRAIN" outside the circle at the bottom. Reverse: Numeric "50" denomination back of boxed "فلسا" (fils) within circle, chain border. Mintage: N/A. Minted Years: 2009-2011, 2014-2016 and 2018. Ruler: Hamad ibn Isa Al-Khalifah. 100 Fils. Year: 2016 - AH1437. Weight: 6.04g. Metal: Bi-Metallic; Copper-Nickel in center and Brass ring. Diameter: 24.00 mm. Edge: Reeded. Alignment: Medal. Mint: N/A. Obverse: "مملكة البحرين" (Kingdom of Bahrain) in Arabic at the top. Bahrain's Coats and Arms. Date on both sides outside the circle. "KINGDOM OF BAHRAIN" outside the circle at the bottom. Reverse: Numeric "100" denomination back of boxed "فلس" (fils) within circle, chain border. Mintage: N/A. Minted Years: 2009-2011, 2014-2016 and 2018. Ruler: Hamad ibn Isa Al-Khalifah. 5 Fils. Year: 2017 - AH1438. Weight: 2.49g. Metal: Brass plated steel. Diameter: 19.00 mm. Edge: Plain. Alignment: Medal. Mint: N/A. Obverse: "مملكة البحرين" (Kingdom of Bahrain) in Arabic at the top. Palm tree in center circle. Date on both sides outside the circle. "KINGDOM OF BAHRAIN" outside the circle at the bottom. Reverse: Numeric "5" denomination back of boxed "فلوس" (fils) within circle, chain border. Mintage: N/A. Minted Years: 2010-2018. Ruler: Hamad ibn Isa Al-Khalifah. 10 Fils. Year: 2017 - AH1438. Weight: 3.41g. Metal: Brass plated steel. Diameter: 21.00 mm. Edge: Plain. Alignment: Medal. Mint: N/A. 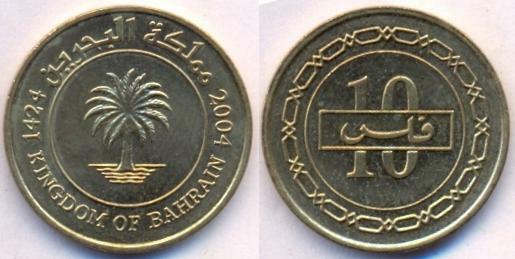 Obverse: "مملكة البحرين" (Kingdom of Bahrain) in Arabic at the top. Palm tree in center circle. Date on both sides outside the circle. "KINGDOM OF BAHRAIN" outside the circle at the bottom. Reverse: Numeric "10" denomination back of boxed "فلوس" (fils) within circle, chain border. Mintage: N/A. Minted Years: 2010-2018. Ruler: Hamad ibn Isa Al-Khalifah. 5 Fils. Year: 2018 - AH1439. Weight: 2.52g. Metal: Brass plated steel. Diameter: 19.00 mm. Edge: Plain. Alignment: Medal. Mint: N/A. Obverse: "مملكة البحرين" (Kingdom of Bahrain) in Arabic at the top. Palm tree in center circle. Date on both sides outside the circle. "KINGDOM OF BAHRAIN" outside the circle at the bottom. Reverse: Numeric "5" denomination back of boxed "فلوس" (fils) within circle, chain border. Mintage: N/A. Minted Years: 2010-2018. Ruler: Hamad ibn Isa Al-Khalifah. 10 Fils. Year: 2018 - AH1439. Weight: 3.37g. Metal: Brass plated steel. Diameter: 21.00 mm. Edge: Plain. Alignment: Medal. Mint: N/A. Obverse: "مملكة البحرين" (Kingdom of Bahrain) in Arabic at the top. Palm tree in center circle. Date on both sides outside the circle. "KINGDOM OF BAHRAIN" outside the circle at the bottom. Reverse: Numeric "10" denomination back of boxed "فلوس" (fils) within circle, chain border. Mintage: N/A. Minted Years: 2010-2018. Ruler: Hamad ibn Isa Al-Khalifah. 50 Fils. Year: 2018 - AH1439. Weight: 4.48g. Metal: Copper-Nickel. Diameter: 21.50 mm. Edge: Reeded. Alignment: Medal. Mint: N/A. Obverse: "مملكة البحرين" (Kingdom of Bahrain) in Arabic at the top. Abstract Sailboat in center circle. Date on both sides outside the circle. "KINGDOM OF BAHRAIN" outside the circle at the bottom. Reverse: Numeric "50" denomination back of boxed "فلسا" (fils) within circle, chain border. Mintage: N/A. Minted Years: 2009-2011, 2014-2016 and 2018. Ruler: Hamad ibn Isa Al-Khalifah. 100 Fils. Year: 2018 - AH1439. Weight: 6.02g. Metal: Bi-Metallic; Copper-Nickel in center and Brass ring. Diameter: 24.00 mm. Edge: Reeded. Alignment: Medal. Mint: N/A. Obverse: "مملكة البحرين" (Kingdom of Bahrain) in Arabic at the top. Bahrain's Coats and Arms. Date on both sides outside the circle. "KINGDOM OF BAHRAIN" outside the circle at the bottom. Reverse: Numeric "100" denomination back of boxed "فلس" (fils) within circle, chain border. Mintage: N/A. Minted Years: 2009-2011, 2014-2016 and 2018. Ruler: Hamad ibn Isa Al-Khalifah. 1965-1997: Isa II ibn Sulman Al-Khalifah.